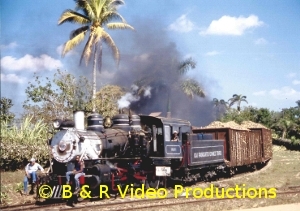 FROM THE RON DAVIES COLLECTION: And now for something completely different from B & R: Steam in Cuba in the 1990s! Cuba, in the Caribbean, was one of the few countries in the world where large numbers of industrial steam locomotives could been seen in daily use into the late 1990s, well after steam traction had been eliminated in other parts of the world. The 1959 revolution resulted in the island spending little on the railways and they became a “time warp” until further investment was available. There are three gauges in use in Cuba: standard gauge, 3’ gauge and 2’6” gauge. Although steam power was eliminated from the main lines in the 1950s, it remained in use for many years on the sugar mill railways. These are used to transport cane from the collection points in the fields to the mills. In fact steam power can still be seen in parts of Cuba today, especially in the Spring during the sugar cane harvesting season. Ron Davies visited the island on a number of occasions between 1995 and 1999 to record all this steam activity amid the breath taking tropical scenery. He used Super- 8mm cameras with the ability to record sound. We see street running, shed scenes, multiple gauge railway level crossings and many trains passing by at speed both loaded and empty. But witness the extremely poor state of the track; it’s a wonder they don’t derail! A very interesting film and a complete contrast to the UK scene. The archive film used is in colour with its original sound track. An extensively researched commentary has been added. Cover photo:- Baldwin 2-6-0 No.1626 of 1914, at Panchito Gomez Toro, Cuba. The first in a series featuring the lines in East Anglia in the 1960s; from Liverpool Street in London to the North Norfolk Coast, from Fenchurch Street to Shoeburyness and many more in between. 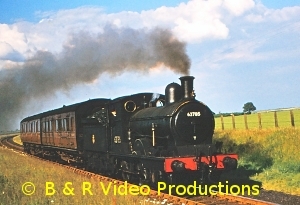 Steam was eliminated from East Anglia early during the changeover period from steam to diesel and so footage is quite rare. However here we feature a variety of steam scenes as well as some early diesel scenes with both green and blue liveries including some interesting DMU journeys over long lost lines. 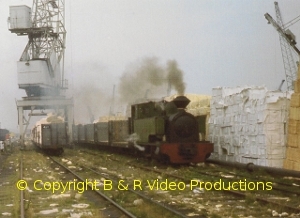 In 1970, we witness the early days of preservation at Chappel & Wakes Colne station (now the East Anglian Railway Museum) with the arrival of “Gunby” from Harlaxton Quarry and Fred Youell’s Class N7 0-6-2T No.69621, from Leeds via Lincoln and Colchester. Early scenes on the North Norfolk Railway contrast vividly with more recent steam at Sheringham and Holt. There is some interesting DMU activity around Cromer Beach. 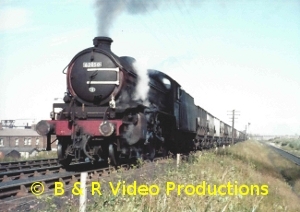 We journey over the Marks Tey to Sudbury line in 1967 with DMUs and visit Wisbech, Kings Lynn, Hunstanton, Ipswich and Yarmouth, with scenes over the years from 1967 to the present day. Locomotives seen include Britannia’s, J15s and ex-LMS and Standard tank engines on the Southend Line. A veritable miscellany!